Bottled water costs $2–$10. Eau de robinet (tap water) does not. Why pay retail when wholesale airfares to France are available? Use Skype (and an internet connection) to make and receive free voice and video calls—or have your friends and family Skype your cell in France for 10¢ per minute or $1–$2 per month. Unlimited train travel in France, or France and some neighboring countries, or even all of Europe—Is a Eurail pass worth it? Paris means fashion, so take a Paris Discount Couture Shopping Tour and shop like a fashion-savvy Parisienne on a budget! You'll buy the clothes you've always dreamed of, at exceptional prices, on this insider's tour of Paris' fashion outlets and go home with a Parisian wardrobe that all your friends will envy. Buy famous couture brands including Chanel, Vuitton and Dior at affordable prices! You can also look for the right fashion accessory to complement your every day wear that screams Paris. Exquisite bags, exclusive scarves, designer shoes and magnificent jewelry are awaiting your purchase on this Paris shopping tour. Would you love to be able to afford the "Haute Couture" clothes of Penelope Cruz, Monica Belluci or Kate Moss? Then join this unique Paris shopping tour that takes you into the fashion insider's world in the most stylist city on the planet, where you can buy the luxury clothes you've always dreamed of, at affordable prices. Shop in select resale shops that sell couture cloths at heavily discounted prices. 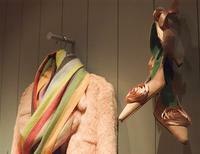 You'll also visit the most prestigious resale shops in Paris, owned by fashion editors and photographers. Designer clothing and accessories are sold here straight off the catwalk, and you'll find collection prototypes at a third of the marked-up price. You'll also attend sample sales on the tour, where the most fashionable brands sell last year's collections at a discount of up to 70%. You'll visit places that only the savviest Parisians know about, and see the workshops of a new generation of talented fashion designers who trained with Paris' famous fashion houses. With their unique style and talent, these up-and-coming designers are definitely names to watch. Your fashion tour begins and ends at a centrally located Paris cafe. - Site to find credit unions and other local banks. These often have low or no foreign transaction fees on their credit cards and ATM fee–refund policies.